“More time with my family” is, of course, face-saving code for being asked to resign or for being drummed out of an elected office for lying, or for being caught in a compromising situation (like a conservative right-wing nut getting caught tapping the foot of a guy in the next bathroom stall or snorting methamphetamine with a gay male prostitute), or for being passed over for a job that should have been yours. 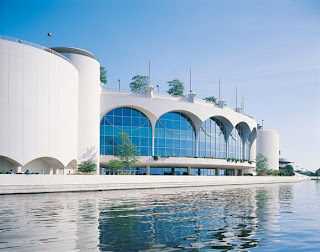 I was deeply honored to be selected as one of four finalists for the position of chancellor at UW-Madison, … I made the difficult decision to withdraw my name from consideration … In the end, my personal desire to enjoy quality time with my wife, children, and grandchildren, combined with my professional interest in advancing a wide range of initiatives I have started at the University of Minnesota, led me to this decision. It could be coincidental that this shoo-in for the chancellor’s position pulled out after the selection committee missed its announced deadline for naming the new chancellor after local media called attention to criticism from the animal rights community and the employees, but it probably wasn’t. The Animal Enterprise Terrorism Act (AETA) and the Freedom of Access to Clinics Entrances Act (FACE) have some similarities. I began thinking about this after an anonymous comment was left in response to my posts [here and here] about the silliness of the graph published in American Scientist (May-June 2008. p 186.) and the spurious supporting data from the Foundation for Biomedical Research. Of course, one has to divide the number of attacks by the size of the group under attack and compare to the baseline rate. But the basic point is that people are being targeted because of the (legal) work they do. Considering the parenthetical point first, the anonymous commentator understood me correctly. Premeditated murder is illegal and carries with it the stiffest of penalties. It makes little sense to me to make the premeditated murder or attempted murder of some people a worse crime than the premeditated murder or attempted murder of other people. Doing so really does seem like twisted logic and seems wholly at odds with notions of equality. But what about the definitions of the crimes and enhanced penalties spelled out in the AETA? Are these commensurate with the defined crimes and penalties stipulated by FACE? 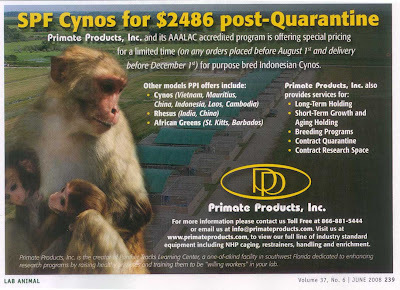 If you send a letter to someone (maybe even post to a public blog) and say that you think they should stop addicting monkeys to nicotine and killing them, and some local district attorney construes this to be harassment, even though the recipient of the letter does not fear for their safety and no economic damage is done, you could end up being fined and spending a year in jail. Same thing if you cross a state line to protest at a puppy mill or slaughterhouse, apparently. Basso’s testimony can be read here. My rebuttal can be read here. The “terrorism” leveled at her was allegedly unwanted subscriptions to book clubs. If true, this is harassment. But it pales in the face of anything historically described as terrorism. Here, it seems, because she is a vivisector, special laws have been passed to single her and her ilk out for special protections. The classic Getting Even: The Complete Book of Dirty Tricks by George Hayduke (2000). and the sequel, The Big Book Of Revenge: 200 Dirty Tricks for Those Who Are Serious About Getting Even by George Hayduke (2001). Spite, Malice and Revenge: The Ultimate Guide to Getting Even (3 Diabolical Volumes in 1) by M. Nelson Chunder (1988). Sweet Revenge: The Wicked Delights of Getting Even by Regina Barreca (1997). And on and on. Calling these authors “terrorists” seems a bit of a stretch. Apparently, following the logic of the AETA, if your neighbor offends you and you send him or her a subscription to an unwanted magazine, you might be guilty of harassment, but if you send the same subscription to a vivisector when you learn that they are hurting animals, you are a terrorist. According to the 2008 New York Times Almanac, the violent crime rate in 2005 (the most recent year of data reported) was 469.2 per 100,000. Comparing the national rate with the rate of crime committed against vivisectors, even including crimes against those targeted because of their weak associations with vivisection (like most of the “incidences” included in the FBR database related to Huntington Life Sciences) there is virtually no crime committed in the name of animal rights, statistically speaking. How many vivisectors are there in the US? This is a hard question to answer, but a very conservative estimate can be derived from statistics and estimates regarding the number of animals used. For 2006, UDSA-APHIS reported that there were just over 1 million animals of covered species used in US labs. The most common estimate of the number of rats and mice used annually in the US is 30 million. Let’s round the total to 30 million animals. 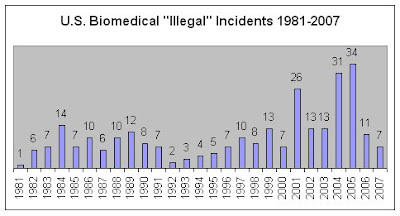 Using the FBR data, in 2005, considering only entries associated with vivisection, there were 34 “incidents,” the highest number ever, according to the FBR data. None of the 34 reported incidents would have been included in the serious crime statistics reported in the New York Times Almanac. None. All of this suggests a certain mania sweeping through the vivisection community. It is in the vivisectors’ interest to fan the flames of fear and further insulate themselves from public scrutiny. Scrutiny leads to criticism and outrage and threatens their livelihood and dark pastimes. Animal rights terrorism is a manufactured myth. Looking again at the FBR (Foundation for Biomedical Research) data regarding "illegal" incidents and American Scientist's republishing of a graph purportedly presenting that data for the article, "Winners and Losers in the Animal Research War," it seems clear that both organizations are manufacturing and massaging information to alarm American vivisectors and, albeit ignorant, sympathetic scientists and lawmakers. I'm reminded of a group of children sitting up late into the night telling each other scary stories and then peeing on themselves when the wind causes a tree branch to scratch against the window. I've already called attention to the fact that even if the FBR and American Scientist data was correct, that the seriousness of the problem it purports to demonstrate is largely manufactured and insignificant when compared against the incidence of genuinely serious crime. 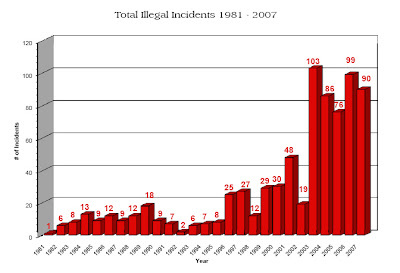 "Total Illegal Incidents" That's a hoot. Now look at the Excel sheet upon which they base the graph. Many of the "incidents" are duplicated. Very many occurred outside the U.S., but the U.S. is passing increasingly punitive and restrictive laws concerning criticism of vivisection and access to public records detailing the activities of vivisectors at the urging of the industry, based on data like FBR's and articles like Conn and Parker's. 10-22-2005: Activists made home visits to executives at Boston Private, which owns 80% of a company that holds HLS shares. It's true that there have been illegal incidents associated with animal rights activism over the past 26 years, and a very few of them -- like the 1984 arson of the then-under-construction Thurman lab at UC-Davis that caused $4 million in damages according the university -- have been spectacular, but the overwhelming majority have been much less costly. Many have been petty vandalism, sit-ins and other civil disobedience, and prank phone calls. Using FBR's data, it can be fairly stated that the so-called Animal Research War written about by P. Michael Conn and James V. Parker, and hyped by American Scientist and other vivisection boosters amounts to 282 "incidents" over a 24 year period, and that most of these were not of a very serious nature, and certainly not sufficient to justify the first sentence of the American Scientist article: "Anti-animal-research terrorists in the United States aim to intimidate biomedical scientists into giving up their research programs, and these radicals are growing bolder." An aside: Parker is an ex-priest, ex-army recruiter, and now, an ex-public relations officer/propagandist for a primate lab (ONPRC.) 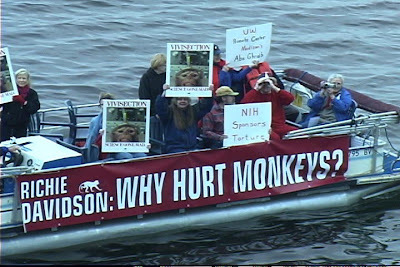 I first met Parker in 1997, a day or so before I began an eight-month-long sojourn to protest in front of each of the then seven NIH Regional Primate Research Centers. A producer of a local television station was sympathetic and arranged to have Parker and me in the studio for a brief mini-debate. This was my first time speaking about the matter and Parker was a pro; if I recall correctly, he got the better of me that day. Afterwords, we stood and talked for a while just outside the door to the station. I asked him why he was so unmoved by the monkeys' suffering. His answer is something I have never forgotten, though he has since denied saying it. I don't recall his exact words, but he told me that the monekys weren't suffering because they aren't like us. He said he knew this because he had looked into their eyes and there was no one looking back at him. Susan Elias wears a Primate Freedom Tag for Maisy Vervet, referred to by the vivisectors at UC Davis as #1994093. This is her tribute to Maisy and all the past and present primate victims of our ethical blindness and greed. 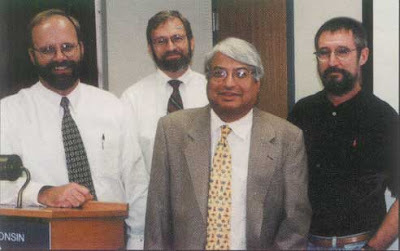 American Scientist is the magazine of Sigma Xi, the Scientific Research Society. The bar graph above, featured in the article "Winners and Losers in the Animal Research War" by P. Michael Conn and James V. Parker in the May-June 2008 issue of the magazine is taken directly from a Foundation for Biomedical Research (FBR) webpage. Here's their graph: You'll notice that the circle graph or pie chart has been added. It's odd, and since it is unlabeled--do the figures represent all the years or a single year?--and untitled, it wouldn't rate an A or even a B as a middle school student product. We all know that Americans score low on scientific literacy tests; maybe this stems from some illiteracy and stupidity on the part of editors of American science magazines like American Scientist. Let's look first at the numbers in the circle graph, and then consider the bar graph and what it really means. The data in the American Scientist come from another FBR webpage (an Excel sheet) here, apparently. According to this sheet (see the Summary sheet), there were a total of 738 animal rights related "incidents" reported from 1981 through 2006 including 511 related to biomedical research, 103 related to food production, 85 related to fur, 27 related to circuses, horse racing, rodeos, and zoos, 45 related to the environment, and 18 other miscellaneous incidents. The circle graph reports that arsons comprised 10% of (some unstated total.) Hum... 56 isn't 10% of 738 or 511. The circle graph reports that theft comprised 23% of (some unstated total.) But 149 isn't 23% of 738 or 511. Bombings: 44 isn't 7% of 738 or 511; vandalism: 317 isn't 45% of 738 or 511; harassment: 103 isn't 15% of 738 or 511 either. So, it's hard to know what to make of this graph. It's pretty much junk. But the silliness of bar graph and the article itself completely swamp the poor scholarship of the circle graph. Let's think about the total number of animal rights related incidents that led to this article being written, its prominent placement in American Scientist (the graph takes up almost a half a page), and its promotion by the editors: 738 incidents in 26 years. The scope of the problem has led to special new laws targeting the people who commit such crimes and creating a special class of people who deserve to have special protection through enhanced penalties for anyone who commits an act or crime that harms or intimidates them or causes damage or economic harm to their place of business or livlihood. Let's put this in perspective and see if any of it makes an iota of sense. 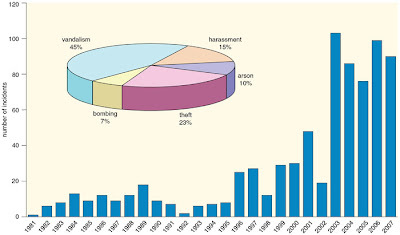 Notice that vandalism and harassment don't make the list, yet vandalism (317) and harassment (103) account for over half (420) of the total number of animal rights related incidents (738) that are claimed to have warranted the new laws, new class of victims, and prominent articles in science journals. Apparently, vivisectors think they are more important than the approximately 24,000 convienience store clerks who are robbed every year. Where are the special laws protecting them? Why aren't the science journals pointing out the ludicrous claim that 738 mostly minor incidents over 26 years is vanishingly insignificant when considered against 11,556,854 genuinely serious crimes in a single year? Graphs like those produced by FBR and reprinted by American Scientist are anti-science and nothing but the most base of propaganda. If placed on the same graph as just the annual violent crime in the US, the animal rights related incidents would be impossible to plot because of their rarity. What's sort of ironically funny is that the editors must think that their scientist readers are either idiots or true believers. It seems clears that they don't consider them critical thinkers. Still wonder why Americans score dismally on scientific literacy tests? Thursday May 1, activists demonstrated outside the lavish home of UC Berkeley primate vivisector Jack Gallant in the hills near the Oakland/Berkeley line. Gallant's research is especially frivolous and cruel. 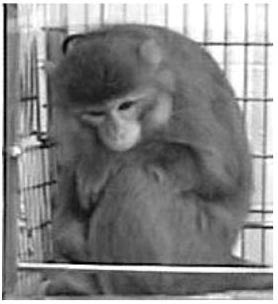 The macaque monkeys victimized by Gallant are confined to restraint chairs and denied the most basic freedom of movement. They are denied water. These sentient beings have holes drilled in their skulls and electrodes inserted into their brains. These animals suffer because of Gallant's greed. This campaign continues on. No matter how many laws they are able to push through. No matter how many activists they try to jail. A common claim by industry spokespersons is that vivisectors and the universities providing them a sheltered workplace are not really secretive about their work (in spite of extensive redactions in documents surrendered as the result of lawsuit or records request) because they publish in publicly-accessible journals for all interested parties to review. I wondered about Gallant's own description of his procedures, so I looked up Gallant's work at PubMed. SUBJECTS AND PHYSIOLOGICAL PROCEDURES. Data were collected from four adult male macaques (Macaca mulatta; two animals used in V4 recordings and two in V1 recordings). All procedures were in accordance with National Institutes of Health and U.S. Department of Agriculture guidelines and were approved by University oversight committees. Details of neurophysiological procedures were previously published (V4: Hayden and Gallant 2005; V1: Vinje and Gallant 2002). Hayden and Gallant 2005, isn't available online, but Vinje and Gallant 2002 is. Subjects and physiological procedures. All animal procedures were approved by oversight committees at the University of Washington (St. Louis, MO) and the University of California at Berkeley and conformed to or exceeded all relevant National Institutes of Health and United States Department of Agriculture standards. Surgical procedures were conducted under appropriate anesthesia using standard sterile techniques (Connor et al., 1997). General. All surgical, training, and neurophysiological recording procedures conformed to National Institutes of Health and USDA guidelines and were carried out under an institutionally approved animal protocol using methods described previously (Knierim and Van Essen, 1992), except as noted below. You should read this section, but it still doesn't describe what was actually done to the monkeys. Felleman and Van Essen isn't catalogued in PubMed, but the other paper is: J. H. Maunsell and D. C. Van Essen. Functional properties of neurons in middle temporal visual area of the macaque monkey. I. Selectivity for stimulus direction, speed, and orientation J Neurophysiol, May 1983. Unfortunately, this paper isn't freely available. Access is available to subscribers of the journal or for a fee. J. H. Maunsell and D. C. Van Essen published another paper in 1983 that is freely available: Maunsell JH, van Essen DC. The connections of the middle temporal visual area (MT) and their relationship to a cortical hierarchy in the macaque monkey. J Neurosci. 1983. But this paper doesn't describe the surgical methods or treatment or the monkeys. 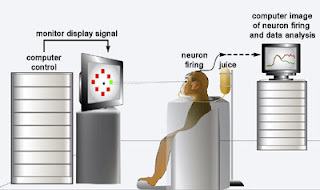 It does however, reference another paper by the authors: Maunsell, J. H. R., and D. C. Van Essen (1982) The connections of the middle temporal visual area in the macaque monkey. Soc. Neurosci. But this paper isn't catalogued in PubMed either. So here, the trail ends. We still don't know with much detail what is actually being done to the animals in Gallant's studies. It is clear that they are being chaired, electrodes stuck into their brains, fluid deprived, and must do meaningless tasks for a drop of water or Tang, apparently. What is also apparent is that when vivisectors write that the procedures and techniques they are using were previously described elsewhere, and gloss over the gruesome details in "publicly-accessible" journals, it is just a shell game. Few people probably take the time to look at those citations. If they did, they'd find, like I did here, that those papers themselves say that the procedures they are using were previously described elsewhere, which, in turn, say the very same thing. This is just another example of the hollow crap that passes for meaningful science and honest reporting in the very dark world of primate vivisection.